As I am about to see my closest friends from childhood, I could not be more excited. Although it won’t be all of 8 of us, we are all together in spirit (M, A, K, J, T, N, S & K!) For all of you that are lucky enough to carry friends from your past who have known you for what seems like forever, reach out today and let them know how much they mean to you. It will make you feel good and it will definitely help make today their ‘newfavoriteday’. ← Little things can make your day better. My only childhood friends are my siblings. That’s not a complaint, but rather a “by way of explanation” as to why I love reading about childhood friends so much. 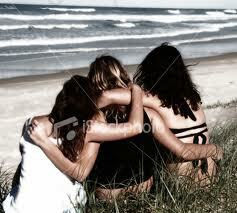 Awww well I count my sisters among my best friends too so we have that in common:). It is a unique gift I have been lucky enough to receive. You will likely see more of these girls in the future. Thanks for sharing this.